Use the Search function below to find stories related to a particular topic or scan our archives by publication date. To broaden your search, set either or both the month and the year to "Any." 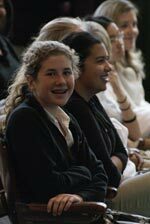 A large and lively crowd of parents turned out bright and early the morning following the election to hear the third speaker in the 2008-09 Learning for Life Speakers' Series: Dr. Dan Kindlon, author of "Alpha Girls: Understanding the New American Girl and How She is Changing the World." With a mix of factual of evidence and ascerbic wit, Dr. Kindlon shared his perspective on the young women in our midst who will be the leaders of tomorrow. Following his presentation to parents, Dr. Kindlon also spoke with Upper and Middle School students about what it means to be an Alpha Girl. He talked about the importance of finding ways to balance in-school and out-of-school responsibilities, both now and in the future. Dr. Kindlon closed out his visit to Hathaway Brown with a discussion session for faculty members of all the School's divisions. He communicated his findings about today's young women in his role as a clinical and research psychologist and professor at Harvard University. He also gave the gathered teachers some food for thought in terms of the way they interact with these very capable students. The Learning for Life Speakers' Series is sponsored by Hathaway Brown School and the Hathaway Brown Parent Association.